The essence of mastery is simplicity. It’s an obvious statement, but like all things truly difficult, much harder to put into practice than to say. It’s particularly difficult when dealing with naturally superficial things like fashion or pop music or action movies. Because what’s on the surface is mostly all there is – the temptation to gild the lily is often just too much; cameras and bodies flying wildly through garish lighting set ups with self-serious plots to match. Part of the pleasure of the original John Wick was how much it was willing to dispense with all that, focusing on brutal, realistic combat and self-awarely offering up the thinnest of plot excuses to make with the gunplay. 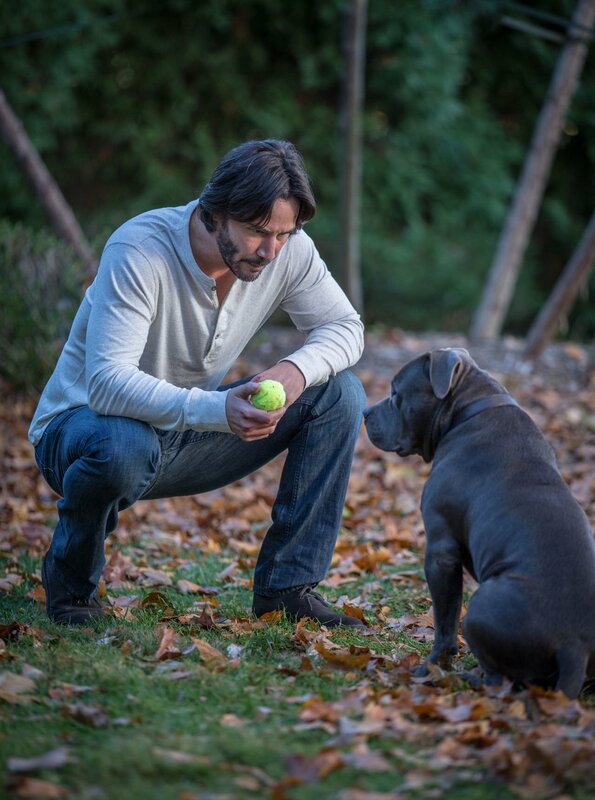 Someone killed John Wick’s (Reeves) dog and stole his car and they were going to pay. No sooner has John hung up his speed draw holster again than a sneering Mafioso (Scamarcio) shows up at his door with an old marker and a desire to use it to get John to do his dirty work. Forced to fight for the right to peace, John is soon winging his way to Rome and the darkest recesses of the strange world he used to inhabit, calling on old friends and comrades in order to complete an impossible task … again. And in the process he may have to break every rule that world possesses, and told those old friends into enemies. For the genre fan it’s aimed at, the parallels to The Empire Strikes Back are impossible to ignore. Realizing the simple but satisfying structure of the first film isn’t enough to sustain a franchise, returning director Chad Stahelski (working alone this time) and writer Derek Kolstad delve deeper into the mythology of John Wick’s world. An expanded roster of cool and calm hit men, the inner workings of the mysterious Continental Hotel which ministers to them, a whispered High Table which seems to run all the illegal dealings of the world – these are things John Wick: Chapter 2 is most concerned with. That and gun play. It works in part because, for all the ambiguous conversations and urgent meetings, John Wick: Chapter 2 avoids hefty exposition – avoids it so completely you may have some trouble explaining who wants to do what to who and why at any given point – in favor of constantly showing. Most of the world-building and mythologizing is left to production designer Kevin Kavanaugh’s lovingly developed world full of gold coins, telegraph operators and old computers, halls of mirrors and museums splattered with blood. Into them the filmmakers have thrown another enigmatic cast of characters chosen — much like the backgrounds — for their looks more than anything else as they tend to glare at or wail at one another as opposed to actually talking. It’s a mode of storytelling which has always benefitted Reeves’ more physical performance style – the weakest part of the first film by far was his one extended monologue (a mistake the sequel does not make). It is extended here to its absurd height in Ruby Rose’s beautiful but silent killer, who speaks only in sign language and becomes obvious in its strengths whenever Scamarcio (who can’t stop talking) shows up. 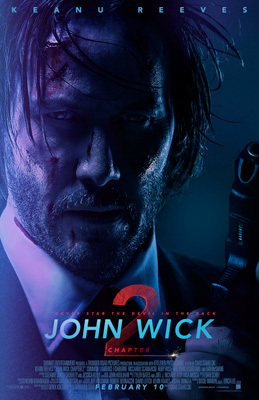 John Wick: Chapter 2 revels in its silences, providing space for the variety of skilled character actors to come in and take up the verbal weight like Ian McShane’s wily hotel proprietor or Franco Nero as his Italian counterpart or Peter Serafinowicz as a sommelier who specializes in guns. They all understand how to be just arch enough to be funny and just serious enough to avoid camp, while leaving the heroes to do the running and shooting. Like most sequels, it does fall a bit towards mistaking fan service and call backs as entertainment and the action scenes are recipients of more than some of that. In an understandable desire to up the ante from the first film, Stahelski and his stunt men tend towards longer, slightly more complicated versions of the same action sequences as that film with little innovation. When they do — such as a fantastic sequence between Reeves and Common fighting first through a fountain and then silently through a train station — it reminds what you liked about the series in the first place and what is lacking from this one. John Wick: Chapter 2 is not the breath of fresh air the first film was, but it does offer up some tantalizing hints to a larger world along with a willingness to blow that world up as needed. If the filmmakers would play a little less safe and show a willingness to move a little further from what they’ve done already, they could match the promise exhibited early on. As it is, John Wick: Chapter 2 is a fun time which does more right than wrong and suggests even better could be ahead.